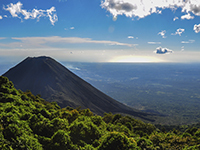 The natural beauty of El Salvador includes Lake Ilopango, El Boqueron National Park and Coatepeque Caldera, a volcanic caldera. All provide unique sights, while the National Palace is a staggering man-made attraction. El Salvador is only accessible from the United Kingdom only by airplane, due to the extremely long flight times required. San Salvador, the capital of El Salvador, can be reached from Birmingham in 18 hours, which is roughly the shortest possible journey time available. Otherwise, flight times can extend to 28 hours depending on where you stop and how long for. El Salvador is seven hours behind British Summer Time and six hours behind Greenwich Mean Time. This may require you to alter your diabetes management, which you should plan for with your diabetes team. IFor this reason, travellers taking insulin should vigilantly monitor blood sugar levels as extreme heat can lead to enhanced insulin absorption. Any planned periods of physical activity, such as walking, could be prepared for by reduced insulin dosages. The currency of El Salvador is the United States Dollar. ATMs are widely located at malls, petrol stations and banks that are open 24/7. Otherwise, all major credit and debit cards are accepted at most establishments. There are no mandatory vaccinations to enter El Salvador, however some are recommended. You should consult your doctor eight weeks prior to your departure in order to receive the vaccinations in time. Some travellers are also recommended to receive vaccinations for other diseases, including hepatitis B and rabies, which can be carried by dogs, bats and other mammals in El Salvador. There is no risk of yellow fever in El Salvador, although the government of El Salvador requires proof of yellow fever vaccination if you have travelled from a country with a risk of the disease. You should note which syringes are available in El Salvador, with U-100 the most commonly used. UK citizens with diabetes will not be entitled to any free medication services while in El Salvador. Securing comprehensive medical insurance will be essential in order to obtain even basic treatment. Diabetic medication is available in El Salvador, but payment will be required from all pharmacies. Urine testing is not widely available, while blood testing equipment will only be on sale in certain pharmacies. For this reason, it is advised to bring a second blood testing metre with you and store it away from your main metre, in case this ends up lost during your trip. The emergency services telephone number to be called in El Salvador is 911. It is worth checking with the manufacturer of your meter in the UK if the particular equipment you require is available in El Salvador beforehand and if it is sold under any different names. What language is spoken in El Salvador? Spanish. Locals will have a grasp of English, but it will pay to learn some basic Spanish phrases to assist in your day-to-day activities.